The scholarships were awarded to students from the three constituent colleges of the University of Sierra Leone – Fourah Bay College (FBC), Institute of Public Administration and Management (IPAM) and College of Medicine and Allied Health Sciences (COMAHS). Addressing recipients and other dignitaries, Chinese Ambassador to Sierra Leone, HE Wu Peng said the scholarships were awarded in recognition of the students’ excellence in academics and their good understanding of China and its contribution to China-Sierra Leone friendship. Ambassador Wu said the gesture was the fruit of a longstanding cooperation between Chinese Embassy and the University of Sierra Leone in supporting the country’s education sector. He said the ‘New Direction’ agenda of President Julius Maada Bio has prioritised education, deeming it a strong pillar for the nation’s development and the moral regeneration and revival of its people. “As a good friend of Sierra Leone, China fully supports HE’s New Direction Agenda and will continue to contribute to its success. 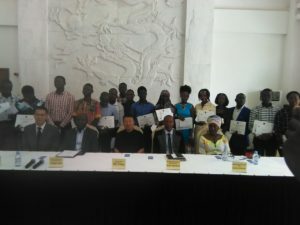 Earlier this year, one hundred and eleven (111) Sierra Leonean students embarked on their study trip to China with funding from the Chinese Government,” he said. Deputy Minister of Technical and Higher Education, Dr. Turad Senesie, on behalf of his ministry and the government of Sierra Leone, praised China’s contribution to education in the country.